May looms as an important recruiting month under the new rules for the 2019 class. Not only is it a time for college coaches to hit the road for spring practices around the state, it’s also a month many of the elite prospects on the radar will make final official visits or decide on a college. With the advent, and success, of the new early signing period, programs no longer have the luxury to wait until the fall to make a big push. A handful of Texas targets are set to decide on a school in May. More could go down as the month untangles. The Longhorns are behind rivals like Oklahoma and Texas A&M. The Sooners and Aggies are currently ranked No. 1 and No. 2, respectfully, on the team recruiting rankings at 247Sports. Texas, with only four commitments, sits at No. 27. Expect the month of May to start Texas’ charge toward the top 10. Signing a top-10 class won’t be easy for Texas in 2019 if history serves. Oklahoma, Texas A&M and Texas haven’t all finished in the top 10 of the same recruiting cycle since at least before 2000. It appears it’s up to Texas to play catch up and change that trend by national signing day. The next expected piece to fall for Texas in the 2019 class is Watson, an out-of-state defensive back who’s listed as a safety by most recruiting services but is being recruited by Texas to play cornerback, much like the case of 2018 signee Caden Sterns. Watson can cross-train at both positions though his eventual position won’t be determined till he’s on campus. It’s a two-team race for Watson. He took his official visit to Notre Dame on April 13 and will do the same in Austin this weekend. 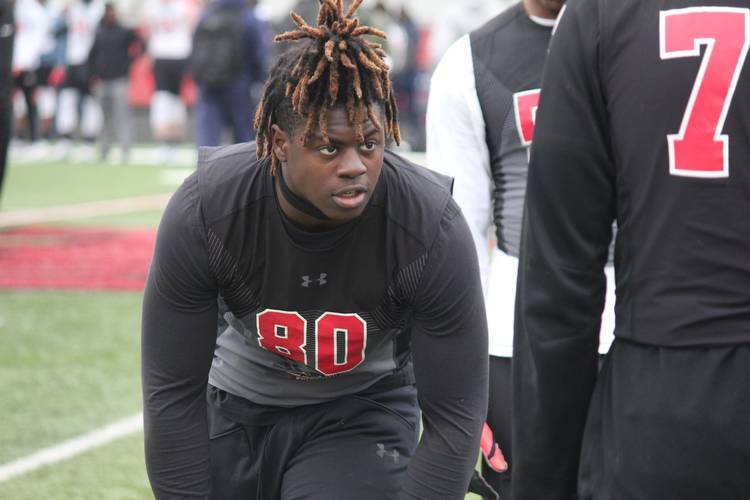 The Longhorns are the team to beat entering that official visit and are expected to lock in his commitment on the visit. Watson will announce his decision on May 1, along with some teammates from Grayson High School. The Longhorns are set to host teammate and four-star linebacker Owen Pappoe that same May weekend, too. Pappoe is considered an Auburn lean and is also set to announce on May 1. Texas hopes an impressive official visit, and a commitment from Watson could sway Pappoe before he decides. The best pass rusher in the state is down to Texas and Notre Dame. The four-star defender took an official visit to Notre Dame in April and will take an official visit to Texas on May 4 before announcing his decision on May 19. It’s a true coin flip for Osafo-Mensah, per the Crystal Ball predictions on the 247Sports composite. The Longhorns carry the current momentum and get the last official visit for Osafo-Mensah. The ability to leave the last impression on the private school star should be important. Osafo-Mensah plays defensive end and outside linebacker in high school. At Texas, he’d likely move to B Backer, much like Joseph Ossai will. No date is set in stone for Wilson to make his decision, but it’s likely approaching sooner rather than later. He was set to announce his destination this week before his official visit to Texas gave him pause. Ohio State is clearly the leader despite Texas’ best efforts during his official visit for the Orange-White game. Wilson took an official visit a week earlier to Columbus and left Ohio State giving the Buckeyes a slight edge. Texas did a great job of showing Wilson the passing offense, but the allure of Ohio State and Columbus, which is where Wilson is originally from, is too much for the Longhorns to overcome. The good news for Texas is that Wilson can’t sign with a school until at least December. That gives the Longhorns seven months to work on him. Like Wilson, Johnson hasn’t announced an official date. The feeling around him is he’d like to get the decision done sooner rather than later. He took an official visit to Oklahoma on April 13 after taking in a Texas spring practice a week before. Texas signed his former high school teammate, Ossai, in the 2018 class and made Johnson a priority for the 2019 class when he was approaching his junior season. The Longhorns are the assumed leader in this one and nothing reported from his official visit to Oklahoma sounds like it swayed him from leaving the state. The date is still unclear, but expect Johnson to announce before June, and as of right now, Texas would be the pick. Watson isn’t technically a prospect. He’s a grad transfer running back from Cal who officially visited Texas the weekend of the Orange-White game. He’s taken an official visit to Texas Tech and will trip to LSU this weekend after canceling a trip to LSU. Watson was impressed by his visit to UT and he clearly saw snaps available at the running back position. He also spent time with fellow grad transfer and future Texas offensive tackle Calvin Anderson. Those two would provide an instant jolt for the Texas offense, and Watson will likely pick a school based on expected playing time. His decision likely follows his visit to LSU. What’s understood doesn’t need to be explained….